It is always nice to find a cheap rail ticket, but there are so many options to buy rail tickets to Windsor Castle that it can be very confusing. Train fares are determined by route, by how far in advance you purchase tickets and by class of service. Add in the fact that there are so many rail companies and you can quickly become overwhelmed. First of all, each of the British Rail companies sell tickets for each other. For the most part it will all be on one ticket - so it appears as one unified system. To see all of the price options look online and consider purchasing in advance. In our case we want to leave from our home base of Paddington Station. This gives us the fastest route to Windsor, but it does require a transfer at Slough Station, platform 1, and will arrive at Windsor and Eton Central. Afterwards we leave from a different station called Windsor and Eton Riverside, and take a direct train to London's Waterloo Station. The cheapest way to do this is a little odd. Do a search for London Paddington to London Waterloo via Windsor All Stations. This ends up being a 1 way ticket. In the past has been much cheaper than buying tickets to Windsor with a return. National Rail train journey planner will come up with the route, but not all of the rail websites will. Try using http://grandcentralrail.co.ukor http://southwesttrains.co.uk. The resulting ticket will be a first class anytime ticket. The anytime ticket does not put any time restrictions on the use of the ticket. You can travel on any train, without changing your ticket. Normally I wouldn't go for a first class ticket but if it is cheaper I will go for it. On the way there on First Great Western, "Customers travelling first class can enjoy a range of complimentary light refreshments, served at your seat." - though my guess is this is for cross country trains and not for the 16 minutes from Paddington to Slough. It should be enough to gain you entrance to the first class lounge at Paddington for a bottle of water and a quick snack. The train back on South West does not have a first class section. At one time FGW had an activity pack for young kids. You can check the Express Cafe, but it looks like they have replaced it with coloring pages you can print off their website before leaving. They are in the process of installing wireless internet on their trains. Look for a sticker on the train that says Free WiFi. First Great Western's website says Free WiFi while other stay that standard class has to pay as you go. First Class has power at the seats and standard class has it at the table. 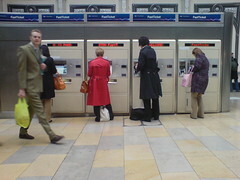 When you buy it online you can go to a self service ticket machine in Paddington and print it out. You need to use the same credit card that you bought it with online. The self service Ticket kiosk is located on the main concourse in front of the ticket office. The train 8:55 am train at Paddington will likely depart from platform 14, which is on the far side of the station from the ticket counter, but make sure you look at the departure board. There is a 8:51 train on platform 1 that will put you in Windsor before the castle opens, but may be worth taking and it a whole lot easier. While at the station take time to go find Paddington Bear! He located in "the lawn". We have a post to help you find out more about Paddington and where to find him. When at Slough Station make sure to find Station Jim, another landmark along the way. Though the London Pass does include entrance into Windsor Castle, the pass doesn't help you all that much in getting out to Windsor itself. London Pass with Transport only works with options on London Transport and this does not get you all the way there. You could go all the way to Uxbridge or Heathrow on the London Tube and the take a bus, though this will not likely save you time or money.